This data set provides measurements of specific leaf area and monthly phenological observations for selected tree and vine species at the km 67 Seca Floresta site, Tapajos National Forest, Para, Brazil. The study site was part of a rainfall exclusion experiment that was conducted from 1999-2006 to develop an understanding of the physical processes driving the observed soil water dynamics at the site. 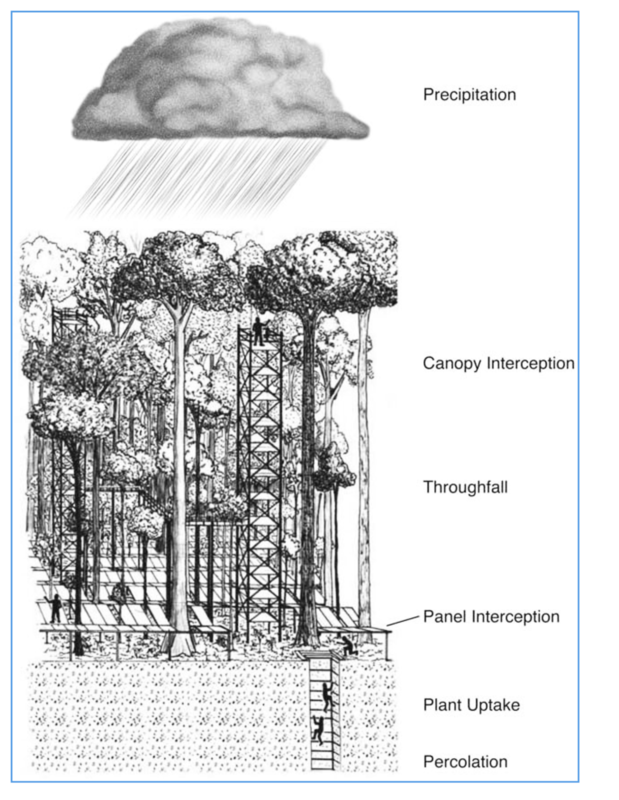 Phenological observations were made from 2001-2004 in rainfall exclusion and control plots. In total, 3,224 leaves were observed across 223 individuals and 56 species. The phenological observations included the month and year when a given leaf was first observed fully expanded and last observed alive. Starting in July 2004 and continuing through January 2006, leaves that had been followed in the phenology study were sampled and leaf area and mass were determined and the specific leaf area was calculated. This data set was archived in April 2014. Users who download the data between April 2014 and May 2019 must comply with the LBA Data and Publication Policy. The investigators were Moutinho, Paulo; Nepstad, Daniel; Alencar, Ane; Andrade, Sergio Viana de; Arce, Javier Alberto; Asner, Gregory Paul; Azevedo-Ramos, Claudia de Barros e; Belk, Elizabeth Leslie; Brando, Paulo Monteiro; Breyer, Lace Medeiros; Cardinot, Gina Knust; Carvalho, Georgia ; Carvalho Jr, Oswaldo de; Costa, Luciana Miranda; Dias-Filho, Moacyr Bernardino; Figueiredo, Ricardo ; Goncalves Junior, Felipe Resque; Guerrero, Jose Benito; Holbrook, Noel Michele; Kaufmann, Robert K.; Kingerlee, Wendy ; Klink, Carlos Augusto; Lameira, Wanja Janayna Miranda; Lefebvre, Paul A.; Maklouf, Eduardo Jorge; Markewitz, Daniel ; Meigs, Garrett Wister; Miranda, Heloisa S.; Molina, Marirosa ; Monaco, Luciana Magalhaes; Oliveira, Rafael Silva; Peters, Charles Merideth; Pinto, Flavia dos Santos; Pupim, Ana Claudia; Ray, David Graham; Reis, Eustaquio J; Schlesinger, Peter ; Schwalbe, Karen R.; Silva, Dulce Alves da; Silva, Wanderley ; Solorzano Cardenas, Luis Anibal; Sternberg, Leonel ; Steward, Corrina Dawn and Zepp, Richard G. You may contact Brando, Dr. Paulo (paulobrando@gmail.com). The data in this file includes the first sampling date on which the leaf was fully expanded and included in the analysis (20010103-20040309), and the final sampling dates on which a leaf was marked as live (the last date recorded was 20040507). 12 Lifespan_2 months Leaf lifespan calculated as the time from first date to date leaf was noted as dead reported in units of months which are uniformly 28 days long. User note: The “date leaf was noted as dead” was not provided. Distinction between Lifespan_1 and Lifespan_2 was not described. Leaf sampling dates from the exclusion plots was from 20040921 - 20060126, and sampling dates from the control plots were from 20040911 - 20050321. Time period: The data set covers the period 2001/01/03 to 2006/01/26. Data can be used to determine average leaf lifespan by species and canopy position as well as seasonality in leaf expansion and senescence. Data have been reviewed for quality. At the beginning of January 2001, one year after the first rainfall exclusion period, branches were selected for observation in individual trees and vines in the canopy and subcanopy. The towers and aerial walkways provided access for the tagging of five branches that were representative of different parts of the crown of each sampled individual. In addition to tagging the branch, each leaf selected was marked with a black marker. The goal was to capture different environments within each the crown of each individual. Leaf longevity was assessed through monthly visits to the sampled branches, observing the presence of new fully expanded leaves and/or leaves that had fallen. If a branch died, another was selected to keep the sample at five branches per tree. The phenological observations ended in 2004. Starting in July 2004 through January 2006, leaves were removed that had been followed in the phenology study. The major and minor axes of each leaf were measured and several disks of known area were punched from the leaf tissue and dried to a constant weight at 60 degrees C. All the disks from an individual leaf were weighed together and then SLA was calculated from their combined surface area and weight. All sampled leaves were alive when collected.